It’s hard to ignore the fact that Samhainn coincides exactly with Hallowe’en, and there’s a very obvious reason for this; Hallowe’en is the direct descendant of Samhainn. 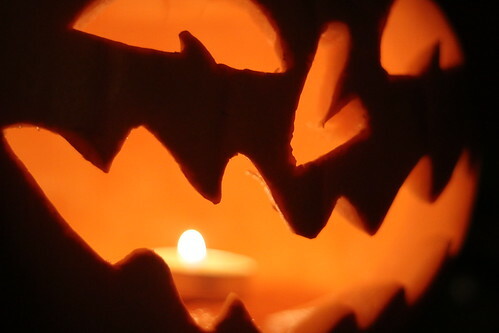 As such, many of the Hallowe’en traditions we know and love today have roots in Samhainn customs, and so of all the Gaelic festivals it’s the one that’s perhaps the easiest for those of us who must otherwise practice alone to share with others. In the run-up to Oidhche Shamhna, clean and tidy the house so everything is in order. Return any items borrowed and make sure you have food in your cupboards. Decorate the house (or just your shrine area, if you prefer) with seasonally appropriate greenery and spooky decorations. You’ll need to plan out a few things in advance – a feast (or a special meal) is traditional so you’ll want to decide what you’re having and make sure you have everything beforehand. You’ll also want to decide what kind of offerings you’re going to give; if you’re making a bonnach Samhthain (or several) then you’ll need to make it/them ready for the evening. You’ll also want to make sure you have any candles and other necessary items at the ready. Carve a turnip lantern (or more if you want). You’ll probably need to do these in advance because they can be pretty time-consuming to do. Pumpkins can be used if you prefer (alternatively or additionally), or else you can try using beets, white turnips, or even large potatoes. Light the Samhnag (Samhainn bonfire) – or flame if that’s not possible – at dusk on Samhainn eve, and make your opening offerings and prayers. Torches of heather, lit from the fire/flame can be carried around the boundary of the property to ward against evil influences. Ash from the fire can also be spread around your property for the same purpose and to ensure fertility in the coming year. Make a feast for Samhainn eve, preferably with lots of friends around for feasting and merriment… Gingerbread, crowdie (cranachan), colcannon, mashed potatoes, cakes, apples, nuts, cabbage and any other seasonal produce are all appropriate foods to incorporate into the feast. Try some Samhainn divination during or after the feasting. Games can be played too – something that kids especially enjoy! Make the Samhainn Parshell and fix above the door for protection in the coming year. Alternatively, if you prefer to keep your traditions Scottish, you could make a rowan charm instead; the Parshell is made in the same way as a rowan charm, using straw instead of red thread. The Parshell should be replaced each year, with the old Parshell being moved to another part of the house, other buildings on the property, or (in this modern age) perhaps even the car. Alternatively, old Parshells can be buried or burnt in the bonfire. Sain the house with water or juniper. If possible, avoid going out on Samhainn eve to avoid attracting unwanted attention – this is especially the case after midnight when the good folk are said to be most active. A small cross of rowan tied with red thread, carried in the pocket, can help guard the traveller from harm if necessary, or an item of clothing may be worn inside out. Then of course there’s guising – going out in disguise is supposed to confound the spirits. Traditionally children didn’t trick or treat, but they did (and still do in Scotland, for one) perform a piece of entertainment in exchange for treats. This can be in the form of a song, a joke, a poem, or any kind of performance piece. The trick comes in when the guiser is refused a treat or feels the host is being too stingy. You might wish to hold an all-night vigil, staying up until sunrise. This can be observed in silence and meditation, or, if sharing with friends or loved ones, you could intersperse these periods with quiet reminiscences about your beloved dead. You could get out old photo ablums and look at photos; pass on the memory of your beloved dead to your children. Storytelling is a particularly appropriate pastime for this festival. If you don’t hold a vigil, leave out a place at the table for your ancestors, with food and drink for them as an offering of hospitality, before going to bed. Pray to them and welcome them into your home. Candles can be lit and left burning overnight (if it’s possible to do this safely) on the hearth, to honour those who have recently passed, and offer some light in the darkness for any ancestors who might visit. Make the bonnach Samthain for breakfast on Samhainn morning.